There's a vast and vicious human trafficking network that supplies Major League Baseball with some of its top players. It starts with the players, superbly talented young men who seek to escape the poverty of Cuba. And it ends with MLB teams that pay massive contracts to get them. In the middle is an underworld of smugglers that goes as far as teaming up with Los Zetas -- one of the world's most dangerous drug cartels. At least 25 Cuban players have been brought into the United States by smugglers since 2004, according to court documents stemming from more than a dozen federal investigations. In all, the players have paid smugglers more than $11.4 million of their salaries, according to court records. The public sees a Cuban refugee land a free agent deal worth millions. But behind the scenes, these ballplayers owe their smugglers a hefty portion of their MLB paychecks. Sometimes their families are held prisoner until they sign extortive contracts that turn their smugglers into their sports agents, according to prosecutors and one player's own account. Some of these details have been exposed in the past. 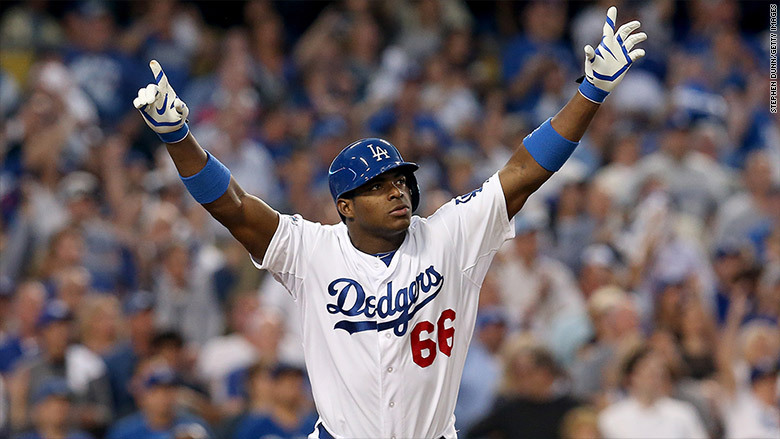 In 2014, a lawsuit revealed how Cuban slugger Yasiel Puig survived a journey through Mexico's underworld before he signed a mega-million dollar deal with the Los Angeles Dodgers. And in November, federal prosecutors detailed the harsh life in Mexican stash houses, where smugglers threatened to shoot "kidnapped" ballplayers if they tried to escape. José Abreu, seen in his Cuban uniform and his Chicago White Sox uniform, is on a witness list for the January trial of an accused smuggler. It's a side of baseball MLB does not publicly acknowledge. But new details about this shadowy underworld will finally come to light next month when sports agent Bartolo Hernandez goes on trial in Miami for allegedly taking part in smuggling 17 Cuban players to secure them as clients. 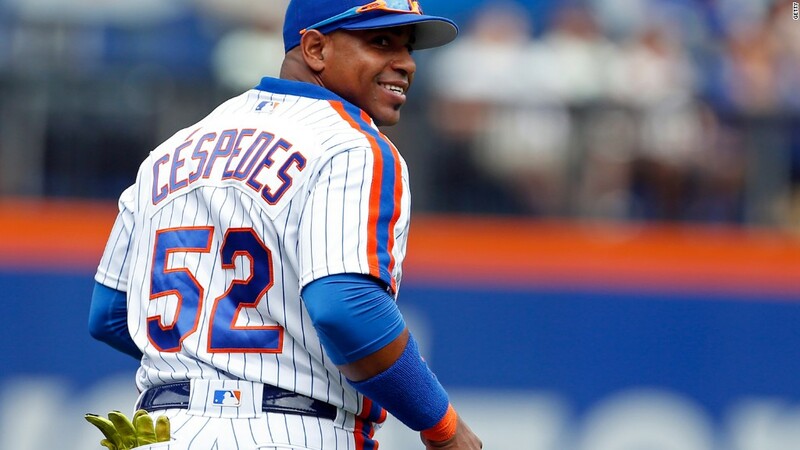 The witness list includes MLB superstars Yoenis Céspedes and José Abreu. The sports agent denies the charges. His lawyer calls them "pure fiction." Like in the United States, baseball is a beloved national pastime in Cuba. But Fidel Castro eliminated professional sports there half a century ago. As a result, Cuba's amateur league is stacked with star talent. These players gain international recognition for their skill, but even the best players make less than 1,500 pesos a month, roughly $56. Only 90 miles north is the U.S. coast. If a player manages to reach Florida, he can immediately cash in on his talents. All Cubans receive special treatment from the U.S. government, thanks to the American "wet-foot, dry-foot" immigration policy. Cubans who touch U.S. soil are immediately placed on a path toward legal residency. But that also means that Cubans who arrive as refugees -- like anyone else in the United States and Canada -- are subject to the MLB's draft. They are picked by only one team. Without negotiating power, rookies are usually offered the minimum salary of $500,000. International players aren't subject to the draft, though. They can negotiate with any team they choose, and the subsequent bidding can send contract deals into the millions. That little wrinkle creates the perfect motivation for smugglers. They sneak Cuban ballplayers into Mexico with forged immigration documents, according to several cases outlined by federal prosecutors. As supposed "Mexican residents," they qualify as international players, and can negotiate free agency contracts with MLB teams. Everyone seems to win. The player gets a shot at an inflated salary. Smugglers get a huge cut. MLB gets its star players. But the entire process fuels criminal enterprises engaged in violent human trafficking. It lines the pockets of a drug cartel. And it preys on the players themselves by extorting them. MLB has declined to comment about the smuggling operations despite numerous requests from CNNMoney. 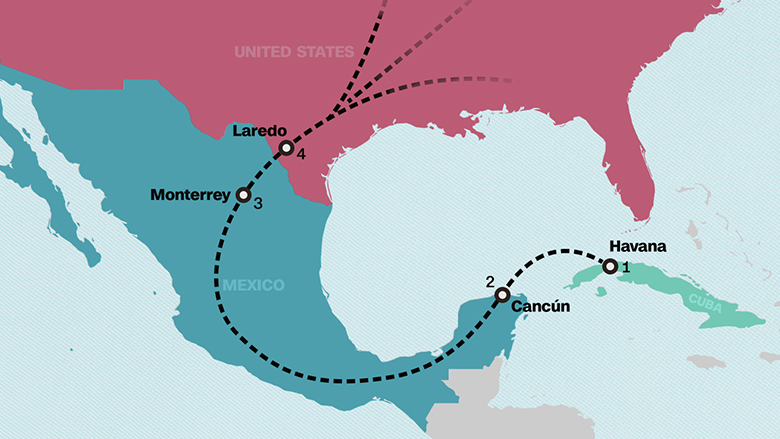 The route used by smugglers who brought Leonys Martín Tápanes and other ball players to the United States. FBI and Immigration Customs Enforcement investigators have not made public their agents' interviews with players and their families. And no baseball player would speak to CNNMoney for this series. But there does exist a single, detailed firsthand account of this odyssey. It comes from one player, Leonys Martín Tápanes, who sued his smugglers in 2014 rather than pay up. The following is the description laid out in his lawsuit. Martín was a star slugger on the Cuban national team when he finally made his way out in late August 2010. He and his father, along with their two girlfriends, arranged a charter boat escape from Havana. At a beach far outside the city, they swam out to the vessel one night. 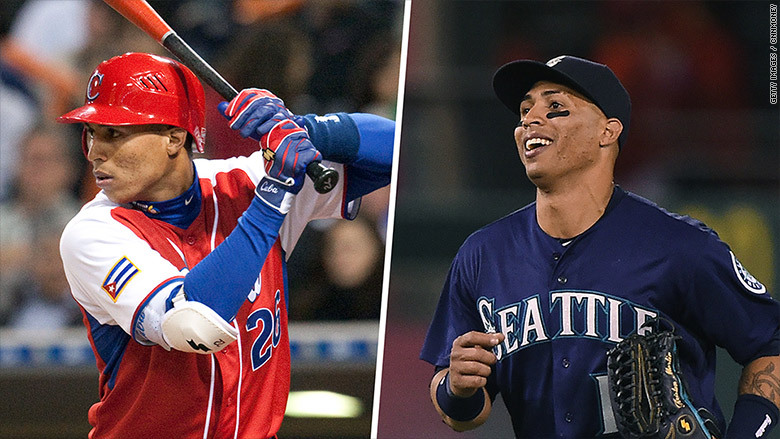 Leonys Martín Tápanes offered smugglers $40,000 to let him go. They refused because he was worth much more. The boat slipped into Cancún's port, where a van waited for them. An armed man drove them to a house 15 minutes away. According to federal investigators, this port operation belongs to Los Zetas, Mexico's notoriously violent drug cartel. In several criminal cases, human smugglers describe how they pay the Zetas to facilitate the operation: The Zetas provide protection from rival cartels and bribe police to ignore the illegal immigration. It was at the stash house where Martín first met Eliezer Lazo, his smuggler. Lazo, a Cuban exile, had traveled from Miami to meet his new prize. Lazo was carrying a holstered gun and wouldn't let him go without squeezing a contract out of him, according to Martín. "You are worth a lot," Lazo told him, according to Martín's lawsuit. Martín, perhaps anticipating his future baseball wealth, offered him $40,000 to let him and his family go. Lazo refused. In the next few weeks, Martín and his family were shuttled from an apartment to a hotel in Mexico, dodging other smugglers wanting to claim the prize. They were eventually separated when Martín's family was moved to Lazo's home in the Miami suburbs, where they lived under surveillance by Lazo. Martín said he feared his family in Lazo's custody was being used as leverage. Meanwhile, Martín was held on a ranch with other Cuban baseball players near Monterrey, Mexico. Prosecutors say the ballplayers were surrounded by armed guards -- and told they'd be shot if they tried to escape. Some months later, American baseball scouts were called in to watch Martín and others perform at a local stadium, Martín claims. The Americans were impressed with what they saw, and several MLB teams made offers. In 2011, Martín accepted a five-year $15.5 million deal from the Texas Rangers -- but only after signing over 35% of his salary to Lazo's so-called baseball training academy, Estrellas del Beisbol (Baseball Stars). That's seven times higher than an agent's typical 5% fee. Martín claims it was only after he landed his baseball contract that he was allowed to be reunited with his family. Martín's harrowing journey eventually came to light. He stopped paying his smugglers their extortion fee. Estrellas del Beisbol sued him for breach of contract in 2012. Martín sued back, arguing the contract was illegal. H. Ron Davidson, a Miami federal prosecutor leading several cases against Cuban baseball smugglers, filed criminal charges against Lazo and his entourage. Federal investigators found that Lazo's organization had done this to at least 17 Cuban players. 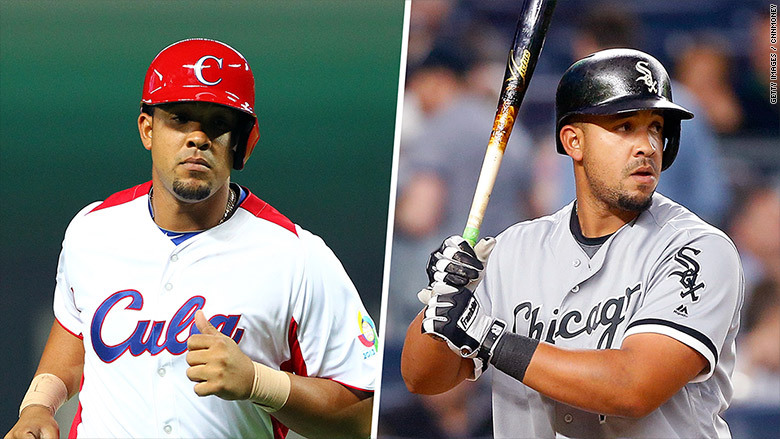 According to federal investigators, Lazo's smuggling operation squeezed at least $6.4 million out of José Abreu by signing him to the Chicago White Sox. They made more than $737,000 from Adeiny Hechavarria, now a shortstop for the Miami Marlins. They drained at least $871,000 out of contracts signed by Dalier Hinojosa, now a pitcher for the Philadelphia Phillies. They also pulled close to $200,000 out of Yunesky Maya's deal to pitch for the Washington Nationals. At least four other players smuggled by the ring ended up in the minor leagues. In 2014, Lazo admitted to extorting and smuggling these Cuban players, as well as many ordinary workers. As part of his plea deal, Lazo agreed to give up his stake in 20 contracts with baseball players. In all, four people in this ring pleaded guilty. The next target in this federal crackdown is Hernandez, the agent who represented Martín and the others. None of the teams mentioned in this story answered CNNMoney's questions about the contracts that were facilitated by smugglers. What's most striking, though, is that Lazo's human smuggling operation wasn't the only one. In another case, a sports agent named Gustavo Dominguez brought in seven Cuban baseball players who played in the minors for the Seattle Mariners, Atlanta Braves, Arizona Diamondbacks and New York Yankees. He paid a drug dealer $225,000 to get Cuban players into the United States, then he concocted an elaborate scheme to hide their presence here, sneak them over to Mexico and sign lucrative contracts from there. Dominguez was found guilty at trial in 2007. He was sentenced to five years in federal prison. Yasiel Puig had to dodge a gunbattle and assassins in Mexico before he won a $42 million contract with the Los Angeles Dodgers. Another investigation nabbed the sports agent who snuck Yasiel Puig into the United States and delivered him to the L.A. Dodgers. That agent, Gilberto Suarez, heard that Puig and others were being held against their will in Mexico by smugglers who kept raising their fees. Suarez put together a middle-of-the-night extraction operation, then helped the four Cubans make their way north while dodging corrupt police officers, Zeta assassins and boat captains, according to court transcripts from Suarez's sentencing. The group was huddled at an airport hotel when the Zetas got into a gunfight with police officers, killing three cops at the airport food court. In 2014, Suarez struck a plea deal admitting to human smuggling and his involvement in the Puig deal. He spent a month in prison. In nearly every case, smugglers say they were helping Cubans escape a dire situation -- and offering them a shot at the American dream, even if it was for a hefty price. What hasn't yet been explained: how much the MLB knew about this. Read the rest of this CNNMoney investigative series.